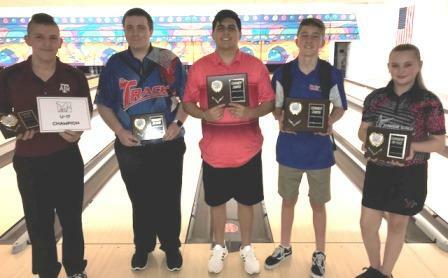 Sergio Torres and Josh Karney picked up JBT titles in exciting dual conference action at Kingman's Cerbat Lanes. Joe Gerencser began the scratch division finals with a 225-194 win over rising star Brock Bivins. A thrilling second match on a tricky pattern resulted in Joe flushing a tenth frame double for a 257-248 win over Solomon Salama, to advance to the title game. Top seed Sergio Torres has been absent from the Tour lately, but maybe he should show up more often, as he climbed to the lead in the last matchplay game, and outstruck Gerencser 244-192 for the title, the seventh of his excellent JBT career. Josh Williams won a thriller to open the handicap stepladder, squeezing past Kathryn Shaffner 203-201. Karney then stopped Williams 220-201 to move on to the title match. Top seed Mackenzie Hammer had been wonderful all day, but Josh was determined to break through for a first title after so many close calls this winter. The match came down to the final frame, with Hammer needing all three in the tenth. She got the first one but didn't get the second, and the 207-199 final gave a relieved Karney that elusive first career JBT title. Aileen Linares snuck by Emily Cheesman 167-155 for the Priority Girls Scratch subdivision win, while Bivins got some revenge with a 233-217 win over Salama for the day's U17 win. Big thanks to the team at Kingman for their usual great hosting job. Want in on the fun? Just check out our schedule and come on down!